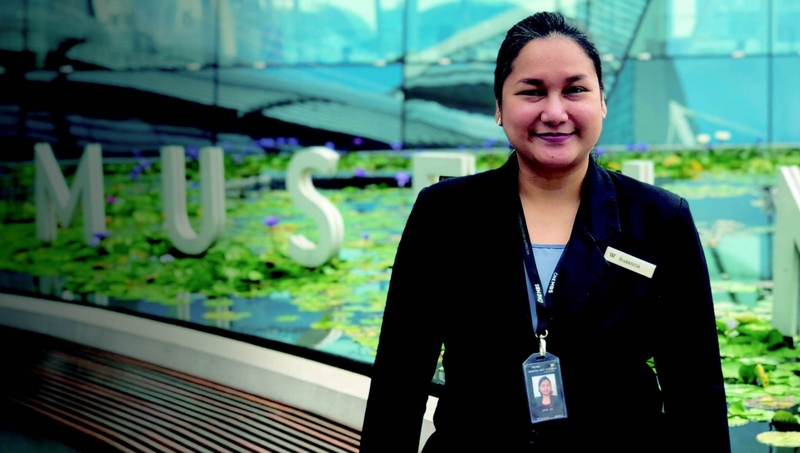 When Suzanna Maule brought her mother to the ArtScience Museum at Marina Bay Sands for the first time in 2017, she was impressed and awed by how the Visitor Services team attended to them. “We felt so welcomed by the team. They were proactive in preempting our questions – it almost seemed like they could read my face!” Maule said. Maule initially joined Marina Bay Sands as a Table Games dealer in 2013, leveraging her counting skills even though she was new to the gaming industry. “My cousin was working as a dealer as well and he recommended Marina Bay Sands as a great workplace to join. I decided to try for the job and trained for almost two months before dealing on the floor,” she shared. While comfortable with the essentials of table games dealing, Maule felt nervous in front of guests at the start as she was unfamiliar with gaming culture. “It took me around four months to gain confidence before I could interact with guests properly. I had to learn how to balance my managers’ and guests’ expectations as well,” she said. Eager to pursue further education and pave her future for more opportunities, she studied part-time for a hospitality degree while juggling shifts at work. She espoused the importance of education and believes that the sacrifice of personal time during that period to achieve her goals was worth every second. “After graduating in 2017, I applied for internal transfers that would allow me to build the skills I’d learned in school. I was actually really excited to join the ArtScience Museum team after visiting with my mom,” she said. After a successful interview, Suzanna embraced the 180-degree career change and started from scratch: her first step was to know her team well and communicate effectively with them. “My favorite parts of my jobs at Marina Bay Sands so far are my teams – even before transferring, I had a great Craps team and was sad to leave them. Now, I have a fantastic team as well. We are always there for one another when anyone needs help,” she elaborated. As a Visitor Services Associate, she must know the exhibitions like the back of her hand in order to create the best experiences for her guests. Before an exhibition opens, the project manager brings the team for a walkthrough to become familiar with the layout and details of the exhibition. Wind Walkers, an interactive exhibition, had a reanimated portion that Maule was able to participate in, adding to her job’s purpose and allowing her to feel included in the installations. “Sometimes, I see fellow dealers who moved on to other positons as well around Heart-of-House. I’m glad that we have the chance to try other roles in different fields within the same company,” she said.